​Most of the early settlers were of moderate circumstances. They had come to make a home for themselves in the New World, where freedom to worship God was assured to them and where an opportunity to obtain a home with sufficient land to support themselves and their families was open to all. They were attracted to this area by the large trees that filled the country on both sides of the stream that had been given the name of Timber Creek. 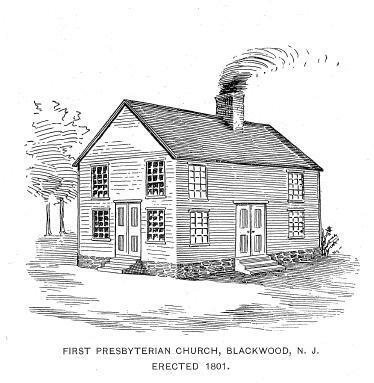 ​The First Presbyterian Church of Blackwood, New Jersey began as “the congregation at the head of Timber Creek.” Settlers made up of primarily Scotch, Scotch-Irish, English, and Welsh united with the congregation at Woodbury in giving a call on November 7th, 1750 to Mr. Benjamin Chesnutt. Mr. Chesnutt was one of six who constituted the first class to graduate from The College of New Jersey (now Princeton University), November, 1748. ​In 1751, Mr. John Blackwood sold, for two shillings and six pence, one acre of land upon which to build a Presbyterian Church. A simple log building containing backless seats made from slabs and placed on wooden blocks was our church beginning. Not even a stove warmed the congregation, so a spirit of pious worship could be maintained. That first building stood until 1801. Mr. Benjamin Chesnutt served the church off and on until he died on July 21st, 1775. During this time, many men of the congregation took places either among the militia or the regular army, so that only a little flock was left behind. It is a cause for gratitude for those of us of the Presbyterian faith that the Presbyterian Church in the middle states and also in the southern states, was a great leader in the struggle against oppression in the time of the Revolution and was really the first body in the country to make its Declaration of Independence, witness the Mecklenburg Resolutions or Declaration of Independence, as they are called, adopted by the Scotch-Irish of Mecklenburg county, North Carolina, May, 1775. ​During the revolutionary War the church struggled and almost became extinct. Occasional supplies were sent by the Presbytery, so that the life, though feeble, was preserved. The minister who supplied them oftenest was Rev. Andrew Hunter, but in 1781 he was appointed a chaplain in the Continental Army and the church was left almost destitute. After the Revolution was accomplished, Mr. Hunter returned and became a regular supply, laboring here and at Woodbury until 1797. He was one of the members of the convention that met at Trenton, December 1787, to ratify the Constitution of the United States. While the churches of Woodbury and Timber Creek were under the care of Rev. Thomas Picton, a new church was built to replace the original log church that had gone to decay. Session records from this time period show the first use of “Blackwoodtown” as the location name. ​The long war of the Revolution had broken up many homes, people were scattered, and only a few were identified with the church. Early resources were used up, and it was only with the strictest economy that necessary supplies for the household could be obtained. The early 1800s were a struggle for this congregation. The church was without the services of an installed pastor for four years, from 1804 – 1808. From 1819 to 1823, the church was again dependent on supplies and became very weak. Although records were imperfect, we can only confirm three members in the year of 1821.Through their faith, dedication, and the labors of the ministers that followed, the church that started out as “the congregation at the head of Timber Creek,” would survive and grow. On May 3, 1828, Major Peter Cheesman was ordained ruling elder of this church alone, thus giving it its own session and making it entirely independent of Woodbury. For about seventy-seven years the two churches had been under one session, but each felt the necessity of being independent and reaching out to larger and more vigorous work for the Master. In 1843, the members determined to have a pastor for this church, separate from Woodbury, in order that they might have his entire service. For ninety-two years, they had been connected with Woodbury. Now each was able to go alone, and so they called Rev. John Burtt to be their minister. He was a Scot, a man of fine mental culture, whose sermons were full of the meat of the Gospel. He was one of the founders of The Presbyterian, a sterling religious paper. In 1847, the existing church was too small for the growing congregation. Additional land was purchased and a stone building was erected in 1848, which makes up part of the present church building front. Again the church was enlarged in 1861 as a result of rapid growth. A young energetic, enthusiastic, and devoted servant of Christ, Rev. Benjamin Everitt, served the church from June 1859 to May 1864. No less than one hundred and four were added to the church during the five years he was pastor. In about 1832, a Sunday School was organized in a mill at Good Intent by Jonas Livermore; later it was moved to the old church which stood in the rear of the present building. This school is said to be the oldest in South Jersey. A lecture room/Sunday School was added across the rear of the stone church in 1880. All money needed was raised from within the congregation and it was dedicated January 1, 1881 free from debt. That same year, the name of Blackwoodtown was changed to Blackwood. In November 1887 a Young People’s Society of Christian Endeavor was organized and a Junior Society was organized in 1891. In December 1896, a second Sunday School of the church was organized at Grenloch, a nearby community in which another Presbyterian church exists today. ​Noteworthy is Rev. Frederick R. Brace who served from March 1867 to March 1898. His service of 31 years is the longest of any pastor. During his pastorate, 258 persons were received into the church, 217 persons baptized, 180 couples united in marriage, and 321 funeral services conducted. In May 1909, many members were dismissed to unite with the newly organized Grenloch Church. After a fire in December 1914, many renovations and additions took place making our church what it is today. The glass and sash windows were replaced with stained glass in 1915. Also gas lights were replaced by electric lights. In 1922, a basement and kitchen were added along with a steam heating plant. A Junior Choir was organized in the spring of 1924 to care for the evening service. The choir had about 28 members. In 1925, an Estey Pipe Organ was installed and a two-tier raised pulpit and choir loft were constructed. The sanctuary had a decorative metal ceiling installed in 1943. A large two-story Sunday School was added onto the rear of our church in 1956. Because of the influx of new residents from Philadelphia and Camden, the Gloucester Township Board of Education requested to use this space until the Blackwood Elementary School was completed. This additional use helped to pay for the addition. In 1963, the narthex was added and the basement area was finished to provide additional Sunday School rooms and a nursery. In the 1990s several preservation projects were completed; one included preserving the original church charter which is older than the Declaration of Independence. ​Since 2003, we have undertaken many projects in mission and ministry. There have been several mission trips – to Ocean Springs, Mississippi; Franklin, NH and New Haven, CT. In 2012 we completed a major building repair/upgrade project. Because of age, weather, and termites, the church building has sustained damage. But, thanks be to God, the church raised enough funds to renovate and repair the chancel area of the sanctuary, the Board Room, bell tower, and roof structures, thus ensuring that our church will be safe and secure to minister for years to come.